Alan Montanaro is a synonymous in Malta with drama; he’s beloved of what must now be a good generation or two for his eponymous dames in Malta’s festive season pantomimes. In the past decade or so, Alan has grown his love of drama and performance to run a successful private drama school, as the Malta branch of Helen O’Grady Academy. You’d think he and his team would have enough on their plate, working flat out all academic year and running summer schools to take the month of August off, rest a little and prepare for the next year. But, that’s not how Alan and a group of close friends and colleagues are spending this summer. Alan, together with Chiara Hyzler, has set up an NGO – ‘Drama Outreach Project‘, or ‘DO’ – which seeks to bring a unique developmental programme using drama and music to teach English and self development to children in underprivileged communities. This summer, the NGO’s first live project sees Alan and a group of eight head to Phnom Penh to run the programme in an orphanage and a drop-in day centre for street children. It’s pioneering work and yet he is determined to make a difference beyond Malta with the skills he and the team have developed here. “I turned 50 a year or so back and it was a sort of turning point also in what I wanted to focus on in life, and where my new ambitions lie. Gaby [Alan’s wife] and I have always wanted to go overseas and volunteer in a meaningful way. 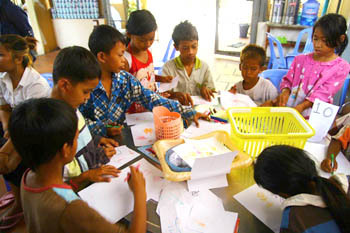 ‘Voluntourism’ is now a word that’s entered people’s vocab, and it best describes our DO Cambodia project. “The actual work on the ground will be a version of our Fun Factory summer schools here in Malta. We’ll be working with the children to create props and then use them in drama, so they ease themselves into this rather unfamiliar environment in a very hands-on way and get to know us as they do so. “Cambodia may seem a distant choice as our first DO Project; it’s not a country that’s been focused on by any Malta-based charity or NGO as far as we know. I have always wanted to learn more about this part of Asia; a region that was in the news as I grew up, but felt outside our sphere of knowledge all the same. The aftermath of the Pol Pot regime has a very long reach; in those years of atrocity under his rule, an entire educated generation was all but wiped out so you have a country still affected by the repercussions of the genocide, yet one with energy and a thirst to be part of an international community. “The children we are going to be working are in two centres; one an orphanage; the other a day centre run by an NGO which takes in children who may have parents but who are sent out to work on the streets. These children find comfort, food, shelter and friends and some education at this centre – ‘Le Restaurant des Enfants‘ – which acts as second home for them, providing them with some stability and safe haven as it were. Its Facebook page gives you the background on how it operates. “Of course, it will be unknown territory for us. Until we arrive, we won’t know exactly what we’ll face and we’ll need to be very adaptable and go with the flow. These are children who won’t have much English, if any, but who probably come across English-speaking tourists on the streets. We hope to get them to develop self-confidence through drama and learn a little more English on the way; skills that will help their daily survival now and hopefully inspire them to continue their education, as best they can. Our key aim is to ensure a legacy and develop a structure on the ground to ensure the DO project summer ’13 is carried on locally. Helen O’Grady does operate across the world and has looked closely at our work in Malta developing English skills through drama, which is something it’s keen to develop. 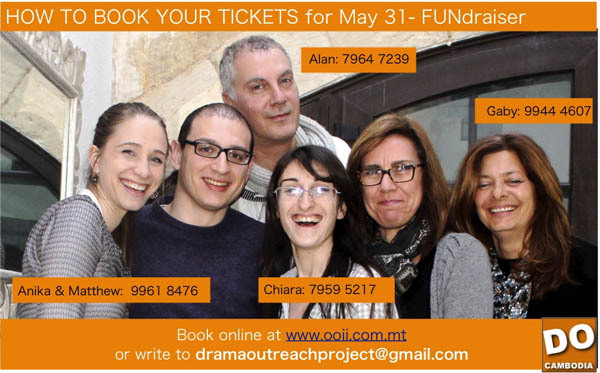 But, the Drama Outreach Project is very much a product of our work in Malta and our personal aims as a group to do voluntary work overseas. 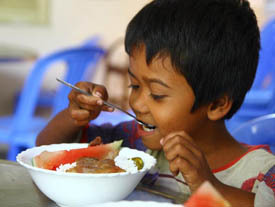 DO Cambodia is holding a fundraising event at the Radisson Blu Resort, St Julian’s, on (31 May. Euro 25 a head gives you a fun, informal evening out, a great buffet and the chance to see Alan in his element in drag as ‘Defsa’ (say no more!). See DO Cambodia’s Facebook page for further details of the project.